This is Steamed Glutinous Rice With Chicken, one of my favorite Dim Sum selections. Most Chinese Dim Sum restaurants usually serve them wrapped with lotus leaves. Depending on your preference, you can either use pork or chicken meat and maybe add a few slices of thinly cut Chinese's sausages (Lap Cheong). I steamed the glutinous rice using a few aluminum tart pan, and small stainless steel bowls, which is the traditional method. Just invert and empty the bowl into a serving plate after steaming and the rice will come out as shown in the picture above. Try it. In a medium saucepan, add 1 ½ tbsp oil and cook the chicken on medium heat. Stir the chicken pieces for about 5 minutes. Then mix in the remainder marinate and cook for another 3 to 5 minutes. Divide the chicken and mushrooms evenly. Then top with glutinous rice and press firmly. Cover the bowls with aluminum foil and steam on high heat for about 40 to 50 minutes. To serve: Remove the aluminum foil and invert the glutinous rice into a small plate and discard the pan or bowl. Serve immediately. Mmm, yum. Is this the same glutinous rice where you wrap it in some kind of a leaf before steaming it? 1. 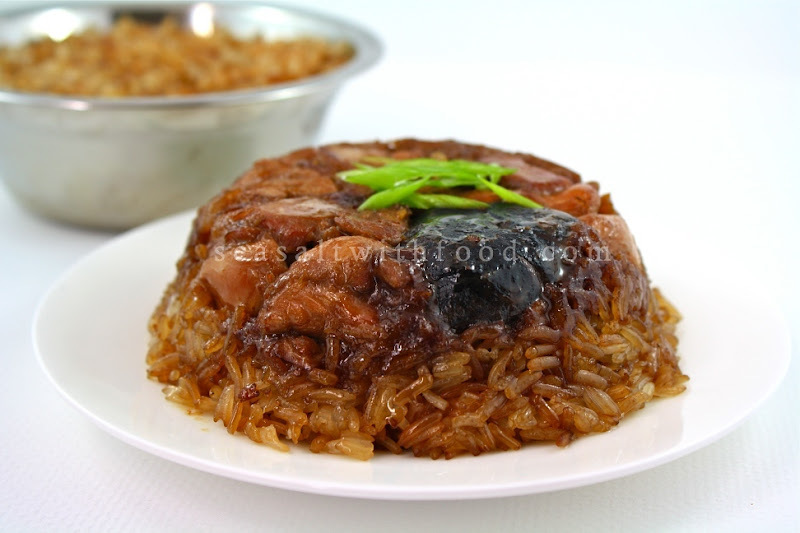 How are you steaming the glutinous rice with chicken exactly? Are you using a bamboo steamer? 2. Have you ever made this in a single big bowl or steamer, intead of using separate ramekins or bowls? I imagine that one can steam only a few bowls at a time, even if you have a gigantic pot or steamer. This means to make ramekins or 4 stainless steel bowls require at least two steamers going simultaneously. I wonder if I could save time by just dumping everything into one big pot and cooking it all at once--say, a rice cooker. Thanks so much for all your recipes, as always. @Pamela: 1. I'm using a 2-tier steamer. 2. No, I have not made them in a single bowl but I'm sure you can do that with a large steamer. I have not tried using a rice cooker though. that looks delicious!!! i usually hate glutinous rice at yum cha because it's not done nicely but yours looks awesome with the lap chong! What a cute way to make this! I should make these single servings for me. Yum. @Divina Pe: Yes but there are several types of leaves for wrapping the rice too. @Elin: You are welcome and thanks for the comment. @gaga: Oh thanks. Ya, do try make them. I just tried your recipe. I steamed the rice the first round and set it aside. When I went back to add seasoning, the rice is hard and lumped together - hence difficult for me to add in the seasoning. Where have I gone wrong? @Anonymous: You have to add the seasoning while the rice is still warm. If the rice is hard and lumped together, wear a food safety glove and mix the sauce into the rice with your hand. Then steam the rice a bit longer. It should work. Thanks Angie! I read other recipes that require water and oil to be added to the rice, together with the other seasonings, before steaming. Is it necessary and would that help to make the rice taste softer? @Anonymous: You're most welcome! I'm not sure about the other recipe, mine turns out soft too. If you like a more softer texture maybe try adding a little water but not too much though. Otherwise the rice will be mushy. My dad's method is simpler. After soaking the rice grains overnight, he'll mix the rice grains with seasonings and steam the rice together with the marinated chicken. What is the added benefit of steaming the rice 2 times and frying the chicken before steaming? @Anonymous: Thanks for sharing your dad's method. The above recipe allows you to keep and steam later, aka Dim Sum restaurant method. So, the steaming time is shorter and the food safety is taken care of. I made this last night in 4 big bowls and it was absolutely delicious! Hi Angie, I'm composing a monthly newsletter for my blog and I'm adding a section with 3 or 4 recipes from other blogs that I particularly love. Is it OK to link to you, and could I possibly use a photo from the post to promote it? I'm aiming to send it out on Tuesday so if you could let me know asap that'd be great! @Becs: Yes, you can use the photo and thanks for the link. Hi, for steaming of the rice, do we add water and steam or steam without any water? @Anonymous: It's not necessary to add water to the soaked rice.